The large tree in front of you is a Manna gum, or wurrun. Within wurrun lives a small grub, djeri. 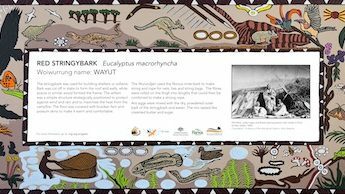 Say the two words together to discover the origin of the name Wurundjeri. The Manna gum had multiple uses: • a tarnuk, or curved tray, was cut from the bark and used by women for carrying seeds and tubers, even babies • a tarnuk could also be carved from the burl or knotty outgrowth that develops on the trunk – this could be used as a bowl for water • the smoke of smouldering manna leaves had medicinal properties • shields and canoes were carved from the bark. Today, scarred trees from which tarnuks, shields and canoes were harvested provide continuing evidence of Aboriginal presence in this land. The name Wurundjeri comes from this tree. URRUN: manna gum and DJERI, a small grub which lives on this tree. In Aboriginal lore, all living things had equal status. To be called after a grub was an honour. Manna gums are found in the Riparian Forest near creeks and rivers. In this reserve, manna gum, candlebark and yellow box eucalypts are found. The large tree in front of you is a manna gum. 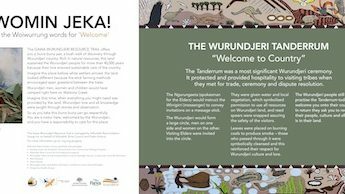 A Wurundjeri Welcome to visitors from another clan or language group was made with a TANDERUM ceremony. A fire was made and manna gum leaves were placed on it making smoke. Each visitor was given a leaf which they were invited to place in the fire and to then walk through the smoke. The TANDERUM gave the visitor temporary use of everything in the land, from the tops of the tress to their roots in the earth. From the heavy inner bark, a coolamon could be cut. These curved trays were used for carrying seeds, tubers and leaves gathered by the women as well as babies, fish, shellfish, whatever was collected. Wurundjeri people call coolamons tarnuks. Gum trees sometimes develop large knotty outgrowths known to us as burls. The Wurundjeri cut off the burl and carved it into a bucket, also called a tarnuk. Rope made from fibrous Stringybark was used for handles. The gum which oozes from these trees is called manna because it is sweet and good to eat. It was also made into gum for sticking the heads onto spears and for plugging holes in baskets and tarnuks. It is why eucalypts are known to us a gum trees. Koalas feed on Manna gum leaves. 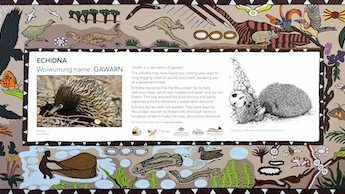 Wurundjeri lore taught that the skin of a Koala must not be pierced. A hunter had to cut toeholds on the trunk of the tree and climb up to get the Koala. Manna gum inner bark was also used for shields. The rounded form made it ideal for deflecting spears and clubs. The leaves of the manna gum had medicinal properties. The smoke was good for healing a fever. When coolamons, shields and canoes were cut from the bark of a tree a scar formed. There is a register of scar trees which records the remaining evidence of earlier Aboriginal life.